Everyone will find their own way of coping with labour on the day. But being prepared with some ideas of things you can try that might help you cope with your contractions and positively work with what your body is doing is a great way to feel prepared and confident for when you go into labour. Your body’s first job with your contractions is to move your baby into the best position for coming out. Sometimes early labour with contractions that stop and start and often feel strongest in your back can be frustrating especially if they are very intense but don’t seem to be having a measurable effect on your cervix. This is very normal and doesn’t mean anything is wrong. Moving about and changing position can not only help the potentially overwhelming sensations of your contractions to be easier to cope with but can also help to create space in your pelvis to allow baby to move around and tuck their chin in to be in the best position to move easily through your pelvis. Planning to ‘just’ breathe through your contractions might sound hippy-dippy or too simple to be of actual use. It’s good solid science though. Controlling and relaxing our breathing allows us to relax our other muscles which allow our body to get to work birthing. Tensing our muscles feeds into a fear response which encourages our bodies to produce adrenaline which is the natural enemy of oxytocin the most important hormone for labour and birth. Switching off our thinking brains and doing everything we can to raise our oxytocin levels gives our bodies the best chance they can have to get on with the job. Breathing doesn’t have to be done any one specific way as long as you breathe in a relaxing way and find a rhythm that feels relaxing to you it will have a relaxing effect. 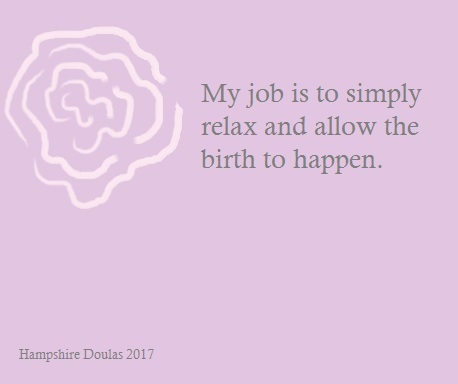 It can help you to feel relaxed and ready with ways to remind yourself to breathe deeply if you practice in pregnancy. Some places you can do this are at pregnancy yoga or Daisy Foundation classes. Having something to repeat to yourself in your head is another effective way of keeping your thinking brain relaxed and allow your body to get on with the job of labour and birth. There’s another blog post with more details on how they work to get your head in a good place approaching birth and can be used to keep your brain busy thinking positively during labour and birth. Water can help you in two ways, labour is really hard physical work and like with other physical activities your body needs to stay hydrated. Having something that’s easy to sip and easy to drop when you need to focus on a contraction is a handy tool. Water can also help to relax you when you get into it. A shower or a bath can be a useful tool for early labour and in later labour, a birth pool is brilliant for providing a lovely safe space and wonderful support to allow you to relax and to find comfortable and effective positions for birthing. The sensations of labour and birth can be really overwhelming, finding something that keeps you grounded can help you to focus on the things that keep you relaxed. This is where a good connection with your birth partner is vital. Not only can your birth partner help you keep calm by helping you feel that you’re not alone but the way they make you feel loved and cared for actually raises your oxytocin levels. The physical connection your birth partner provides also raises your oxytocin levels and increases your relaxation. ← How to choose a baby sling or carrier.